This refreshing dessert features mangoes, although you can also use any summer fruit you like. Be sure to keep the tangy lychee granita, though - it makes things far more interesting. 1. Drain lychees, reserving tin liquid, and purée until very fine. Strain through a fine sieve into a cup measure; add liquid from tin to make 1 cup combined. 2. Gently heat sugar in 30ml water until dissolved. Allow to cool. 3. Combine purée, sugar syrup and lime juice to taste. Pour into a shallow metal container and place in the freezer. When almost frozen, scrape with a fork to create a fluffy texture. 4. 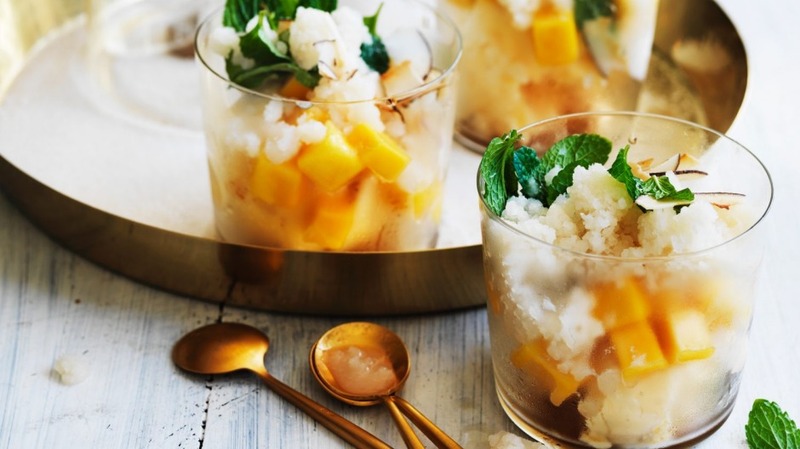 Place a scoop of ice-cream in a chilled glass, then a spoonful of mango, a few mint leaves and a spoonful of granita. Repeat. Top with coconut and mint leaves.